Written by: Malone on May 20, 2013. Alfred Hitchcock famously spoke of the difference between surprise and suspense. He illustrated his point with two people speaking at a cafe. One of them places a bomb under the table and we’re told that it will go off at say, 1 o’clock. By letting the audience know what is happening, they’re not surprised by a sudden explosion, but they’ve experienced fifteen minutes of suspense. Hitchcock said that you must always keep the audience informed – unless the surprise is a twist ending, which would be the highlight of the story. Most everybody can enjoy a good thriller. The best ones are full of suspense and tension, letting the audience white-knuckle it to the finish. On Tuesday, May 21st Well Go USA releases one such thrill-ride from Hong Kong: ”Nightfall”. Released on both Blu-Ray and DVD, “Nightfall” remembers both old Hong Kong crime movies as well as the Western noir. Twenty years ago, Eugene Wang (Nick Cheung) was thrown into prison for the killing of an 18 year old woman. Now released, he begins to stalk Zoe (Janice Man), a young pianist who looks remarkably like his victim. Elsewhere in the city, a police detective named George Lam (Simon Yam) is haunted by his wife’s suicide. As if searching to find answers for her actions, Lam buries himself in his work, often occupying his mind with cases that have long since gone cold. One day, the body of Han Tsui (Michael Wong), a famous musician and Zoe’s father, is found on the beach, mutilated beyond recognition. Lam finds himself assigned to the case and it’s not long before the Wang is named the prime suspect. But as the investigation unfolds, more questions begin popping up than answers. With a homicidal maniac on his tail, Detective Lam learns that not everything is as it seems and solving a crime from the past may be the only way to bring Han Tsui’s killer to justice. Zoe (Janice Man) and her father (Michael Wong) are being hunted by a killer. Director Chow Hin Yeung (who co-wrote the screenplay with Chi-long To), does a fantastic job setting a mood. The killer is a mute with an unsettling scar around his neck and flashbacks are presented as if played through a scratchy, old grindhouse projector. The movie opens with an intense, violent prison fight scene, plunging the audience into the ruthless world/mindset of the antagonist and establishing a sense of danger that lasts through the film. Just like Hitch would’ve liked. But the film also keeps the audience in the dark for it’s many twists and turns. An obvious comparison to “Nightfall” (for many reasons) might be Roman Polanski’s “Chinatown” with a constant truth that changes throughout the film. Chow Hin Yeung is able to present the truth a little at a time, until the story comes together in its shocking, yet gratifying end. Of course, this is due largely in part to a well written script, but the the end result is pieced together like a well crafted puzzle. The performances are all top-notch, but Nick Cheung is truly amazing as Wang. We never see him speak in the film, everything is conveyed through looks, expressions and movements. Late in the picture we find out why and it’s pretty gruesome. But Cheung is able to make the audience feel a variety of emotions through this silent performance and you can’t fake talent to get that result. 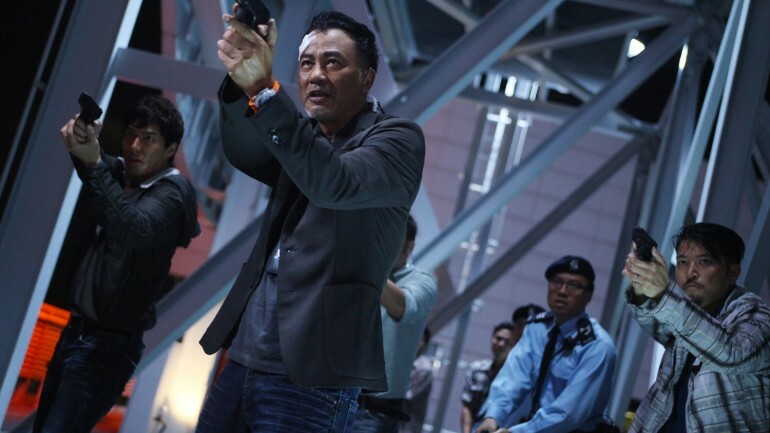 Detective Lam (Simon Yam) won’t stop until he finds his killer. Ardy Lam’s cinematography is breathtaking and “Nightfall” is one of the most beautifully shot films I’ve seen in some time. Lam uses darkness and shadows to bring out danger like a traditional film noir, but also plays with colors to elevate the concept. Want wanders the streets of Hong Kong in a steely blue darkness, suggesting a loneliness to the man. Shots and scenes often seemed composed to suggest influences by filmmakers such as Hitchcock, John Woo or Stanley Kubrick. A fight scene on a cable car feels pulled right from “North by Northwest” while a quick zoom in on an attacker standing at a balcony rail might have been lifted from “Eyes Wide Shut”. The “Nightfall” score also feels like it’s trying to imitate the style of filmmakers such as these. Much like in “Psycho” or “Vertigo” staccato notes are played to heighten the feeling of tension and like in almost anything Kubrick has made, classical music sets the mood – often an eerie one. Of course you could say that is the composer’s goal on any film, but I challenge you to watch “Nightfall” and not feel that it’s a bit obvious. Wang (Nick Cheung) won’t go down without a fight! The Blu-Ray’s 1080p presentation is a delight to look at with it’s rich darkness and glowing colors. Flashback scenes feel like they were guest directed by Jean-Pierre Jeunet with an old-timey flickering projector quality that’s certainly enhanced by the clarity of the picture. With such eye candy up on the screen, why wouldn’t you want to see the film in the best possible format? The 5.1 DTS-HD MA Surround mix really comes through in scenes like a fight in a shower room with water sprinkling around you or a glass ceiling raining down on people below. The overall presentation ranks quite high with this disc. However the extras are a little sparse – all you get are the film’s trailer and a “Making of” featurette, though it runs roughly 45 minutes long. Overall “Nightfall” scores a 3 out of 4 angels. Top-notch presentation and a solid story make it worth your while. Some may be able to predict the twists, which will take some of the fun out of things, but cinephiles will enjoy picking out visual references to Western pictures. It’s been awhile since we’ve seen this type of film hit the States from anywhere outside of Korea. Hopefully, Hong Kong’s got more of them up their sleeve. Hey Malone, when are you going to do another giveaway?! I want to win!